It was the apogee of the Global Financial Crisis and a contact had rung in with a big scoop, a list of the toxic derivative “investments” which the collapsing Wall Street bank, Lehman Brothers, had flogged to scores of Australian charities, churches, government agencies and local councils around the country. The value of this stuff, these Collateralised Debt Obligations (CDOs) as they were called, was plunging sharply. Much of it had zero value, there was no market for it, no buyers, only sellers. It was the worst of top-of-the-market, tarted-up investment bank rubbish. Some of the buyers faced financial Armageddon. Many had no idea they would wake up to read about it in The Age and Sydney Morning Herald on the morning of August 16, 2008. Careers were on line line, reputations potentially shattered. It was dynamite. And the source was rock-solid. 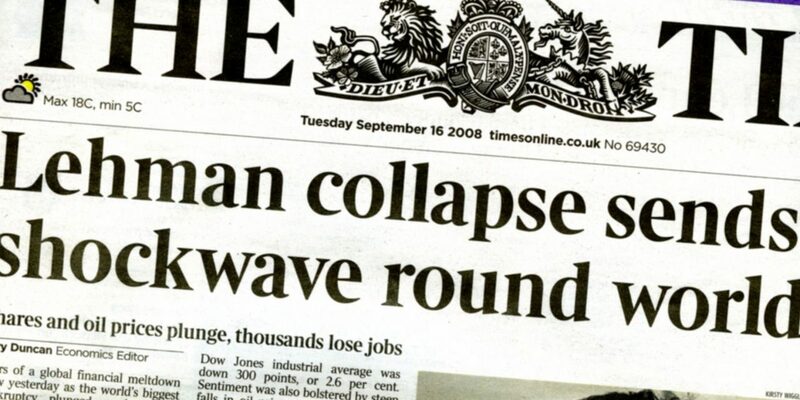 Lehman put its crisis management consultants to work and did everything it could to discredit the story. Dozens of complaints flowed in. the ABC’s Media Watch was sniffing about. The reporter, yours truly, fought for the story but the SMH caved in and ran what must be one of the world’s longest clarification/apologies. The Age however, stuck with it, although the Business Editor Michael Short and Editor-in-Chief Andrew Jaspan came under intense pressure. Jaspan was excoriated daily in Victorian parliament by then Premier John Brumby and his political allies. That was despite me debunking their claims. Lehman had indeed sold toxic subprime instruments to Victorian state agencies, such as $7.5 million in CDOs to Ambulance Victoria. “The company shed 45 per cent of its staff in wave after wave of redundancies, reducing its total headcount from 10,631 to 5780,” wrote Ben Butler in The Australian over the weekend. To be fair to media executives, the digital media revolution has cost millions of jobs world-wide. This is a global phenomenon, the sunset of a giant 20th century industry. Almost all traditional media outlets have responded to this revenue carnage by cutting costs. The impact on quality, on the independence of the media, has been savage. The thing which has been harder to measure is self-censorship and editorial capitulation. This reporter spent eight years at Rupert Murdoch’s News Corp, working as a columnist on The Australian, and then eight years at Fairfax Media, two as SMH Business Editor. It is the ultimate indulgence for a journalist to write himself into a story but this one is of sufficient public interest given the present Nine tilt at Fairfax and attendant challenges to journalism. Two perspectives then: one, shrinking profitability begets damage to a product. The precipitous fall in ad revenues makes a media company more reliant on its existing advertising clients; hence captured. Two, KPIs are a pox on institutional cultures. In the case of Age editor Andrew Jaspan, he was literally being offered a financial bonus for sacking his own staff, “Key Performance Indicators” based on headcount. When reluctantly recruited to SMH Business Editor, this writer was offered the same, to which I responded, “I’m not a KPI kind of guy”. They gave up. It would not have improved my performance or the product on iota, only taken my eye off the main game, putting out a good newspaper. That these reward regimes are now so ubiquitous, has undermined journalism. They have attracted sub-par managers to positions of power, people ruthless enough to put their own personal finances above editorial integrity. More broadly, KPIs have led to disastrous consequences in other industries such as banking, vid the Commonwealth Bank and AMP. They even have them at government agencies such as the Australian Securities & Investments Commission, schemes which reward official loyalty as much as performance. Will you participate in a cover up if your bonus hinges on it? Surely the temptation is often too great. To be honest, this journalist has made as many mistakes as the next. People make mistakes. Corrections flow. Time constraints make it perilous, unavoidable. What is far more perilous however is the present menace to public interest of media organisations self-censoring. Is mainstream media up to fighting the battles anymore? Have large vested interests won the game? This observer is not as dismissive as many former Fairfax colleagues – indeed Paul Keating and Andrew Jaspan too – of the Nine takeover of Fairfax. It is another nail in the coffin but, as with Fairfax, there are many good journalists at Nine. There will be some synergies, if the deal proceeds, and journalists will continue to try to publish the truth. Yet media will continue to splinter. Facebook and Google are taking the lion’s share of ad revenues and competition from small publishers on the internet will see media devolve into niche players such as this website and global giants who can afford to charge for subscriptions because they still have a cost base and something of quality to offer. What would be a dagger to the heart of journalism, and public interest, in Australia, is if the NSW decides to adopt the self-interested recommendations of the NSW Bar Association and allow large companies to sue for defamation. It will take out small publishers and large while being used as a commercial tool by multinationals and other large corporations.